Local governments are the only bodies with the ability to make changes to public spaces, such as roads and sidewalks. As a result, they have a duty to citizens to ensure that they put the necessary research and skill into engineering, building, and maintaining public spaces, and take steps to correct a design that appears to be unsafe. When government offices fail at this task and someone is injured as a result, the government could face liability for those injuries. That said, government officials and bodies have certain protections from liability when making traffic planning decisions. This leaves judges with the task of determining whether a government office should be held liable for the costs of someone’s injuries after an accident, or if the office is immune from liability. A case recently before the Kings County Supreme Court required the judge to decide whether a claim against the City of New York filed by an injured cyclist based on negligent traffic planning and design should progress toward trial. The case, titled Olenick v. City of New York, was based on an accident on the Brooklyn Bridge. Donald Olenick, the plaintiff, was riding his bike in the marked bike lane when a pedestrian stepped into the lane. Olenick was unable to come to a stop before reaching the pedestrian, fell, and was seriously injured as a result. Olenick filed a lawsuit against the City, arguing that the City had failed to implement necessary traffic control on the bridge, such as separations between the pedestrian and bicycle lanes, and had failed to implement a plan to renovate or repair the roadway. Olenick also alleged that the City had notice of the risk of bicycle/pedestrian accidents on the bridge since numerous similar accidents had occurred there within recent years. The City attempted to have Olenick’s claims dismissed through a motion for summary judgment, arguing that it was immune from liability based on the fact that it had already implemented a plan to improve safety on the bridge. When a city becomes aware of a safety issue on a particular road or at an intersection, they are generally required to investigate the area and assess whether improvements to the signage or traffic control devices would help to reduce the risk of injury at that location. As a rule, cities in the State of New York are immune from liability for making these sorts of traffic planning decisions, even if they aren’t completely successful at preventing accidents in that location. This immunity only exists, however, if “once a municipality is made aware of the dangerous traffic condition it … undertake[s] reasonable study thereof with an eye toward alleviating the danger.” In other words, once the city learns that a location is dangerous, not just any safety improvements to that location will make them immune to liability for injuries at that location. The improvements should be based on reasonable research and investigation into the reasons the location is unsafe and ways it can be made safer that address these issues. In the case at hand, the City claimed that it had already implemented a plan to improve safety on the Brooklyn Bridge, namely by marking the respective lanes to improve visibility. 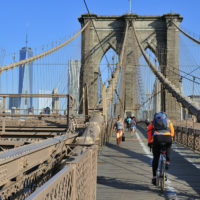 However, Olenick argued that the City had not conducted a reasonable study on the risk of injury to cyclists and pedestrians on the Brooklyn Bridge before implementing this plan, as it was obligated to do. The City admitted that it had not conducted a study before implementing its plan. The judge ruled that the City’s failure to conduct a safety study on the bridge before implementing its plan prevented the City from claiming immunity from liability, and the case could proceed toward trial. If you’ve been injured by a dangerous condition on a New York City street, subway, bus, or other public place, find out if you may be entitled to money damages for your injuries by contacting the dedicated and experienced Manhattan personal injury lawyer Leandros A. Vrionedes for a consultation, at 212-889-9362, or at 718-777-5895.